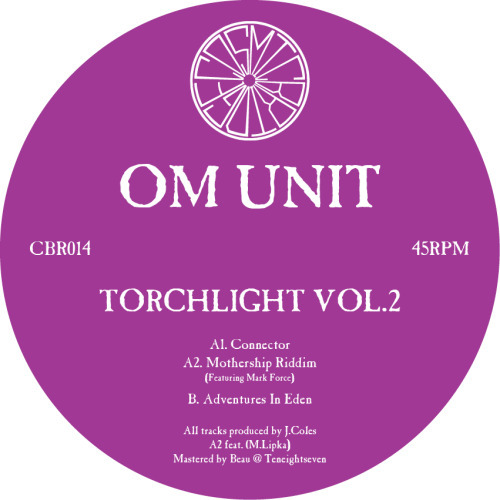 Cosmic Bridge kicks off 2016 with the second volume of Om Unit’s ‘Torchlight EP’ series, five productions of taut dance floor explorations for the mind, body, and soul. Torchlight Vol. 2 continues Om Unit’s exploration of ideas perpendicular to templates of the dubstep, jungle, and drum & bass worlds. Locked on a 160– 170bpm guiding axis, the EP delves into the deep end of sound system beats with subtle melodic flourishes, thoughtful sampling, and loose structures. ‘Connector’ opens proceedings with the meditative focus Om Unit has made his trademark, the mood rising in an understated manner. ‘Adventures In Eden’ comes across like a lost 1994 Good Looking Records anthem, kicking off with a funky percussion line that is soon joined by dense, bright pads—leading the listener into the void—before the breaks are let loose for five minutes of raw skanking. On ‘Mothership Riddim’, Om Unit teams up with underground legend Mark Force (Reinforced Records, Bugz In The Attic) to call all ravers back aboard for further interplanetary dance floor journeys. The pair weave timeless elements—bright chords, fluid breaks, nasty bass lines—into an uplifting slice of future funk. The EP closes with a pair of eyes-down meditations: ’Transformation’ deploys samples that evoke a trek into the deep jungle while ‘Angry Buzz’ is a darker trip on the back of a bass line melody evoking the spirits of classic 2005 dubstep. Spread out! Torchlight Vol. 2 is the sound of a producer in full control of his creativity inviting you along for a ride into the expanses of sound system’s future. Whether enjoyed at home, on the road, or in front of a speaker stack, just let go and come along.